Long Island Aquariums, Fish Tanks, Exotic Fish and More! 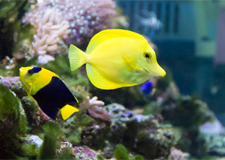 At B.T.J.’s Jungle of West Islip, New York – your one-stop pet shop – we take pride in carrying the highest-quality aquariums, fish tanks, fish tank accessories and cleaning products and fish food. To demonstrate to our customers exactly what we mean, B.T.J.’s is equipped with an impressive showroom filled with tanks, aquariums and fish! Interested in exotic fish? We have a wide variety that will add to your tank or aquarium, too. It’s an assortment of rare fish that no other pet store can match. Although we sell a broad assortment of standard fish tanks, we also offer customizable aquariums that will fit your home or business. In fact, our pet store was featured on Extreme Makeover: Home Edition for our beautifully built, custom aquariums. No matter what shape or size you desire, our fish tank experts can build it for you! Our aquariums are built with either acrylic or Starphire glass, the latter of which is the best glass material on the market. These state-of-the-art materials – which are provided by our partner Aqua Vim – allow us to offer the longest warranty in the business. Depending on the design of your custom-built aquarium, this will determine which glass is the best to use. Our pieces can be custom-crafted to be fully enclosed with modern wooden cabinet systems. They can also include rounded glass to fit perfectly within an office or business environment. Our circular aquariums are great for open-space environments and provide a beautiful, calming view of the fish inside. We work with various cabinetry and furniture companies to fit the needs of our customers. Btj’s imports the finest live rock from places all over the world like Indonesia, Fuji Islands, and Tonga Island Branch just to name a few. We are always competitively priced and offer bulk case discounts upon request. Our rock is loaded with all types of growth to ensure that we provide our customers the best quality possible. And yes, our rock is cured and contains lots of purple coralline algae. In addition, our fish come from all over of the world. We import from exotic regions like the Red Sea, Australia, Philippines and Indonesia just to name a few. We offer the largest selection of hand-picked Coral, SPS Frags, and Inverts so that you can find the perfect addition to your aquarium. And if there is something, in particular, you’ve been searching for just ask! We are certain to have access to it since we use trans-shippers from all around the world and have been for over forty years. We specialize in Reef tanks, one of our pride and joys. Keeping your budget in mind, we can design a custom filtration system that is tailored specifically to the needs of your tank. We provide only the best quality products to our customers while providing access to unparalleled knowledge and experience. After all, being in business for 46 years has allowed us to create a network of meaningful connections that we are always excited to share with our family and customers. We know that your tank is a focal point in your home. That’s why we always tailor our offerings to you. We provide all types of finishes and custom shapes in order to ensure you have the ability to match your specific décor. We at BTJ’s evaluate ourselves with the highest standards when it comes to our fish room. With a state of the art display, we can carry an array of species that would simply be impossible for some of our competition to do. Keeping our finger on the pulse, we stay in front of the hottest trends and use this knowledge to ensure our customers stay informed on the best possible options. For instance, we increased our stock of lower maintenance tank setups to help cater to the recent craze with Glo Fish & Siamese Fighting Fish. We are glad to say that we are one of the last family-run pet stores that consistently caters to the specific needs of our customers. We can implant a custom plant tank that utilizes co2 to ensure that you’re getting the most natural environment possible for those plants to thrive amongst a community of fish. We also carry the widest selection of hard to find Catfish (and Pleco’s). Our selection of Discus , Angels and Community fish are one of the best of the island. We individually evaluate each of the design elements for all of our customers’ aquariums in order to guarantee you have the proper eco-system in place to ensure healthy living and easy maintenance for your setup. If you have something larger in mind don’t be afraid to let us bring it to life! We love to go big. After all, we have 46-years of experience building large residential and commercial sized aquariums and we’d be happy to put that to work for you. Custom jobs have always been our passion, just ask our friends over at Extreme Home Makeover who came back for seconds! Don’t shy away from your creative expression just because it’s never been done. There’s not a doubt in our minds that we have the knowledge and resources to make any dream tank into a reality. After the magic happens, we work with a variety of different cabinet suppliers who specialize in their own diverse range of finishes and materials that are always at your disposal. We can make your tank blend with your décor or in contrast, stand out like the 4th July. We take pride in seeing your project through til the end. And that’s why we provide some of the highest quality stock tanks & stands at prices that can’t be beat. Never again will you have to piece-meal your dream tank setup. We always provide our customers with surprise, custom package deals so that convenience and affordability are one and the same. And of course, as always, everything comes fully guaranteed. In case you were wondering, we also carry a large selection of African Cichlids form Lake Malawi, Lake Tangernekin and Lake Victorian. These are the brackish water species that are rarely found in your local mom-and-pop. Here at BTJ’s, we pride ourselves on being different and standing out from the rest. That is just one reason why we continue to ensure our customers have access to not just a greater variety but also a hand-picked selection of exotic species as well. And yes, we also carry the much sought after Synadotus Catfish. Our selection ranges from Fancy Goldfish “Oranda’s” to Ryucins, to Redcaps Bubble Eyes, Pearl Scale Black Moore’s all the way to Lion Heads. In short, no matter what you are looking for we will make sure we get it into your hands with a smile every step of the way. After all, having 46-years of meaningful connections is precisely what allows us to do this. Want to include aquatic plants in your aquarium? We offer various aquatic plant life that we can customize to your liking and tank needs. By providing the right amount of flowing CO2, this provides a natural living environment perfect for both your plants and fish. Looking for fish supplies or aquarium supplies? We stock all the products you need including; bright colorful coral pieces, filters such as AquaClear, ammonia, algae destroyer and more! If you’re looking for a custom-designed aquarium, then don’t hesitate to give us a call at 631-587-8191, fill out the convenient contact form on our website or come straight down to B.T.J.’s Jungle at 144 Sunrise Highway in West Islip.